October 23, 2017 by stas | Filed under Energy Work, Practices For Men, Practices For Women. We have almost reached the top of the energetic structure according to the science of Yoga, and in this article we will discuss Ajna, which is the second to last chakra. It’s an excellent chakra to move your sexual energy to, and it is very accessible to most people. footnote 1: If you have just landed on this article I recommend that you first read the background story behind moving your sexual energy during love making. Ajna chakra is found in the center of your forehead, slightly above the brow line. If you roll your eyes up and slightly cross them towards the middle, you are likely to feel a certain kind of tension in a certain area of your forehead. This is your Ajna chakra. Of all chakras, Ajna is my favorite chakra, because I instantly felt its energy once I was shown its location, but much more so, because this chakra is the control center of all chakras, so if one has a very developed Ajna, he can compensate for any deficiencies in the lower chakras. footnote 2: most of my life I had been trying to refine the control over my existence, so when I discovered the power of this chakra I was so rejoiced, that I dedicated a lot more time working on this one. It also became the main chakra I was directing my sexual energy to during love making. It was also the easiest one for me to work with. Only recently, as I have embarked on the path of letting go of control, Anahata has become the one that I work with the most. I’m very grateful for all the work I have done on the Ajna chakra, as it’s thanks to that work I can now feel safe to let go of control, and work on integrating my ego and my spirit, rather than being at war with my ego. And there are many other aspects of Ajna chakra that help me on the daily basis. For example, being able to convey my knowledge and experience to you in a way that is understandable and is engaging to read. You will notice that you will be drawn to work with certain chakras and less so with others. Follow your intuition and work with those that you are feeling longing for. Over time your preferences and needs will change. While the first 5 chakras have corresponding physical elements: earth, water, fire, air and ether (semi-physical), this 6th chakra is of a pure mind essence. Science still struggles at figuring out the mind. Nowadays we know how to work with the mind, but we still have no idea what it is and where it lives. 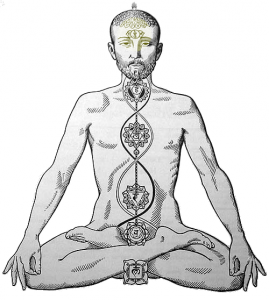 The Yogis believe that Ajna chakra is the seat of the mind. If you enjoy the process of deep thinking this is the chakra for you. If you believe in the possibility of reincarnations, it’s suggested that we alternate genders almost every birth, so for example, if this lifetime you are a woman, most likely you were a man in your previous life. You will carry a latent man in you, since through lifetimes you need to develop the masculine and the feminine aspects. Ajna chakra helps us to balance the two aspects, the yin and the yang, the masculine and the feminine. It’s also the last bastion of duality. That is, this the last chakra where there is good and bad, up and down, black and white, etc. In Sahasrara, the seventh chakra, the duality is no more. Ajna chakra is responsible for intelligence and powers of discrimination, especially spiritual discrimination, and it helps one to make the right choices in the domains of his life, where mind prevails. Ajna is the gateway to macrocosmic mind, and in some may even manifest supernatural powers, such as telepathy and clairvoyance. The following are a few aids you can use to cultivate your Ajna chakra in general and during love making to keep your focus on it and thus sublimate your sexual energy to it. Before you start with the chakra-specific tools please make sure to read first the explanation on how these tools work and why they can help you. Body positions that will aid in activating the Ajna chakra are with woman on top, with her back to her lover. If you use this position you may want to add lots of pillows to make both of you comfortable, as it can be quite a strenuous position if remained in for an extended period of time. Wear some gold jewelery, or jewelery that embeds purple stones to activate Ajna chakra. Gurdjieff Movements are said to activate Ajna. Follow the link for a lot more information on that very unusual dance/movement style, originating with George Ivanovitch Gurdjieff. Surprisingly this style is still alive and cultivated nowadays. There are books on the Gurdjieff Movements, but the reviews suggest that they should be learned in person to be done correctly. footnote 3: I have never tried those myself, so if you were directly involved in practicing those, please kindly share on how it felt with regards to activating your Ajna chakra. Thank you. It’s very difficult to find movies that activate purely the Ajna chakra. Movies and documentaries about mad and not so mad scientists and mathematicians, like Pi (1998) and A. Einstein: How I See the World (2000) are along the lines and usually tap into Ajna and Vishuddha energies. Watch movies about and by magicians and hypnotists. For example Darren Brown‘s series on hypnosis and mind control are quite an excellent choice and are a lot of fun to watch. Just beware that almost all of these movies will have elements of other chakras, so make sure to focus on the mind aspects when you watch the movies. Books that deal with the nature of the mind will help to activate and hone the Ajna chakra. So first of all look into books on the Yoga of the mind, such as Yoga Sutras of Patanjali and Raja Yoga. Even if you are not planning on practicing these styles of Yoga (or any Yoga for that matter), just reading those materials will activate your Ajna, since they were written masters with very powerful Ajna’s. Next ponder books on and by scientists where mind is put to hard work, such as Albert Einstein’s “The World As I See It”. And of course any books that help you to improve and shine your mind will be of an excellent choice. There is the subconscious mind land, with Joseph Murphy’s “The Power of Your Subconscious Mind” being the classic, and then subliminal work and mind control at large. One aid for helping to move the energy up your energetic structure is to contact your tongue to the upper palate, while pushing it back as far as possible without causing any physical strain. Interestingly, this technique is used in Yoga (ketchari mudra), Tao (cosmic orbit) and Buddhism (mindfullness). It doesn’t work directly on Ajna, but for our purpose of moving the sexual energy to that area it fits well. I did find this method very useful on a few occasions, when there was an unexpected surge of strong sexual energy coming through, but also in a non-sexual context – when I experienced a strong urge to sneeze or laugh and for whatever reason I wasn’t supposed to let those happen. Comments and suggestions are always welcome! Please use the comments section below.